The 2016 exhibition attracted 1 605 manufacturers of electric automation technology and 63 291 visitors, out of which 528 exhibitors and 15 352 visitors came from other countries than Germany, making it Europe’s leading electric automation exhibition. 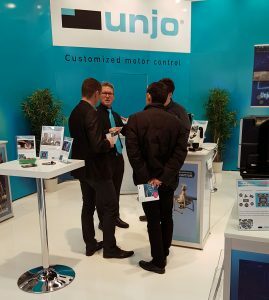 This was the 8th time Unjo participated in Nürnberg sharing our customized motor control solutions expertise by discussing development projects with a focus on improved speed, positioning accuracy, increased power and cost-efficiency within compact space requirements. 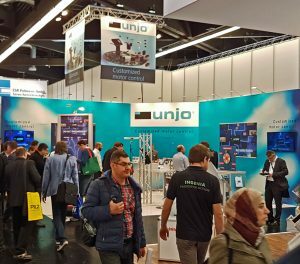 “- Our continuous focus on developing and designing customized motor control solutions, meeting the very highest demands for optimized performance and cost-efficiency, has provided long-term growth and an ever-growing customer base for Unjo AB. SPS IPC Drives is the logical and natural venue to network with existing and new customers as well as EMS partners”, explains Undine Jänes, CEO, Unjo AB.